Tee times were released on Friday with McIlroy grouped with the winners of this year's majors, Jordan Spieth and Zach Johnson. He suffered a "total rupture" of ligaments in his left ankle last month. McIlroy's post on Friday showed the inside of a private plane along with various emojis depicting a US flag, a thumbs-up symbol and a golf flag. The on-board video screen suggested McIlroy was departing from Faro in Portugal, where the four-time major winner was understood to have been practising and the location for Thursday's video of him hitting a driver on the range. On Wednesday, McIlroy posted a video in which he was seen balancing on his left leg and twisting and throwing a gym ball to mimic the actions of the golf swing. He has also shared photographs of his ankle from four and three weeks ago, saying: "I've come a long way since." 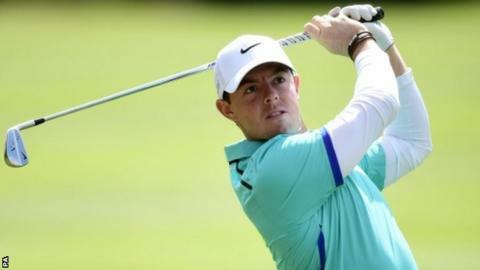 McIlroy, who was ruled out of the Scottish Open and the defence of his Open and WGC-Bridgestone Invitational titles with the injury, was always going to be included in the tee times for Whistling Straits unless he called the PGA of America to withdraw. His last competitive round was a closing 66 in the US Open at Chambers Bay on 21 June.